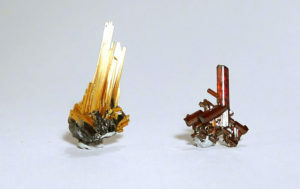 Rutile is calming, and bestows a sense of inner strength, and courage. 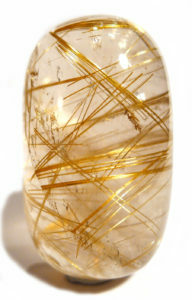 Gold rutile, in particular, gives a feeling of fulfillment, telling us we need nothing more in our lives to be happy. It works as an anti-depressant, partly through the affect of the colour on the Solar Plexus, but also because it helps us to become aware of our own strength, and therefore feel more in control of our lives. Being “out of control” can be a prime factor in depression. It aligns primarily with the Solar Plexus, but also connects with the Third Eye and Crown Chakras, making it ideal for tuning in to the higher realms, and as an aid in meditation. Red rutile calms the mind, and protects us by veiling, rather than shielding, so we can work safely on a spiritual and psychic level. It can also help us to tune into the different layers of the subtle body.